Twenty-six 3-car Class 107 DMUs were built by British Rail at Derby in 1960. Most of their career was spent working out of Glasgow Central. 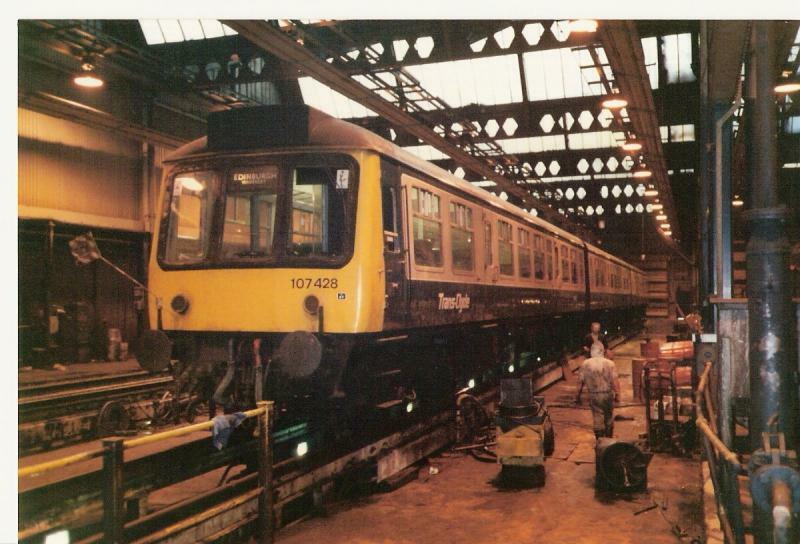 The class 107 were for the most part based at Hamilton Depot. Some units were also allocated to Corkerhill, Ayr and Dundee for a time. After Hamilton depot closed in 1982, the 107s were based at Ayr Depot, replacing the Class 126 DMUs previously maintained there. A fire at Ayr depot in 1984 damaged several DMUs and sets 442 and 448 were withdrawn. In June 1986 the whole fleet was grounded with axle defects, although the trailer cars remained in use in hybrid formations. Restored to traffic in 1987, some units were transferred to Eastfield depot, and worked services out of Glasgow Queen Street. A reshuffle of the Fleet in July 1988 saw Ayr loose its DMU allocation, with the blue 107 sets moving to Haymarket, and the Strathclyde liveried sets moving to Eastfield. These numbers were changed to 107 7xx at the end of 1988 to avoid clashing with class 156 sets, and changed again to 107 0xx from 1990 to avoid clashing with 158 sets. After the introduction of the Strathclyde PTE class 156s in October 1989, the only Class 107 duties out of Glasgow Central were the train to Edinburgh via Shotts. 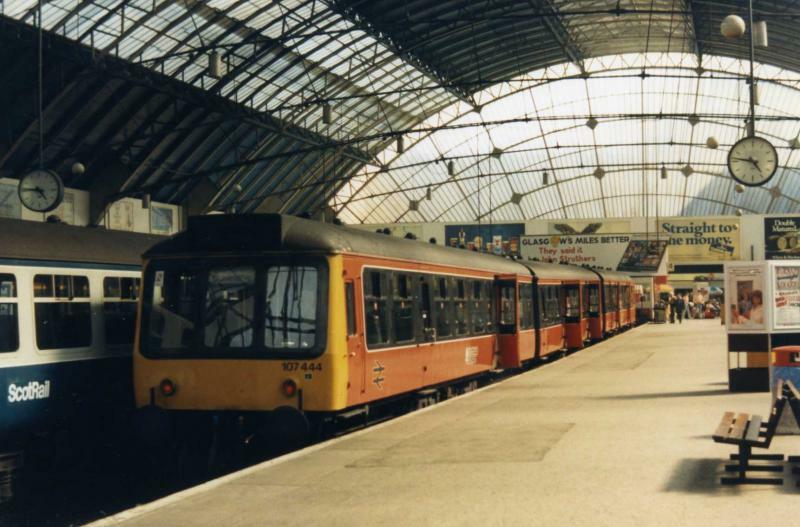 By October 1990 the Class 107s were the only type of 'first generation' DMUs still operating in Scotland, and all 20 sets were now based at Eastfield. In July 1991, the Glasgow Queen Street to Dunblane and Falkirk Grahamston services were turned over to class 156s and the remaining 13 sets were transferred from Eastfield to Haymarket. Their final duties were mostly on peak time trains between Edinburgh and Fife. Class 101 units were brought in to replace them and the last 4 sets were withdrawn in August 1992. Three 2-car units were converted in 1992 for use as Sandite units during the Autumn. They were used until 1994, with converted class 37 locomotives used the following year. 11 class 107 vehicles were bought for preservation. Created by SC318250 and last modified by Dysgraphyk at 01:08, 23 of February 2008.